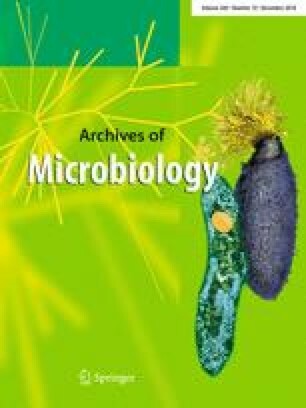 A novel bacterium, designated DCY112T, was isolated from the rhizospheric soil of a ginseng-cultivated field in Gochang-gun, Republic of Korea. Based on 16S rRNA gene sequence analysis, this isolate was assigned to the genus Rhodanobacter and is closely related to Rhodanobacter soli DCY45T (98.0%) and R. umsongensis GR24-2T (98.0%). Strain DCY112T is Gram-negative, catalase- and oxidase-positive, aerobic, non-motile, rod-shaped, and produces yellow-pigmented colonies on R2A medium. Q-8 was the predominant respiratory quinone. The major cellular fatty acids were iso-C15:0, iso-C17:0, and summed feature 9 (iso-C17:1 ω9c and/or 10-methyl-C16:0). The major polar lipids were phosphatidylglycerol (PG), phosphatidylethanolamine (PE), an unknown amino lipid (AL1), and an unidentified polar lipid (L3). The genomic DNA G + C content was 65.2 mol%. DNA–DNA homology values between strain DCY112T and related strains were lower than 55%. The low DNA relatedness data in combination with phenotypic and genotypic tests indicated that strain DCY112T could not be assigned to a recognized species. Strain DCY112T showed antagonistic activity against the fungal pathogen Fusarium solani (KACC 44891T), which causes ginseng root rot. The results of this study support that strain DCY112T is a novel species belonging to the genus Rhodanobacter, for which the name Rhodanobacter ginsengiterrae is proposed. The type strain is DCY112T (= KCTC 62018T = JCM 32167T). The NCBI GenBank Accession Number for the 16S rRNA gene sequence of strain DCY112T is KY694397. Digital Protologue Database (DPD) Taxon Number TA00434. The online version of this article ( https://doi.org/10.1007/s00203-018-1560-9) contains supplementary material, which is available to authorized users. This study was supported by a grant from the Korea Institute of Planning and Evaluation for Technology in Food, Agriculture, Forestry, and Fisheries (KIPET No. 317007-3), Republic of Korea.